... an Angelic Pretty item. 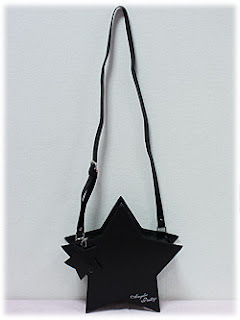 They have this star shaped bag at the moment and I want one! What is happening to me? It's so tacky and 80's and way too expensive. It has inspired me to have another go at making a handbag though. I was going to try something like a heart shaped one, but maybe I'll try a star instead. Also I got a couple of nice books for Christmas that I'd like to tell you about. I'm lucky to have a few days off now until I have to go back to work so I might even have time to do both. Hope everyone has a lovely time!! 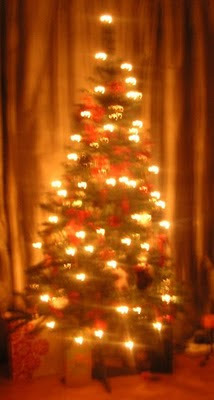 I love Christmas time. And not just the big day. I love shopping for presents and making Christmas-y things and watching Christmas songs on VH1. I've tried something new this year - edible tree decorations. 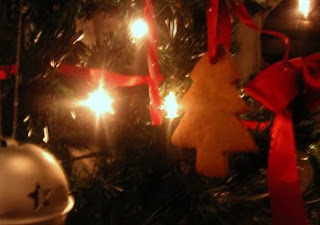 I used Nigella's recipe from her Christmas book (recipe also available here) to make these sort-of-gingerbread biscuits. Next time I think I'll use a lot less pepper than she suggests. They still taste nice but, yes, peppery. I tried a few different cutters like hearts and bells but the tree shaped ones came out best. I really like their traditional look, especially with the red ribbons. I was going to make cards again too but I didn't have time as I was designing engagement announcements. *giant grin* That's right my man and I got engaged! Today is the first of December - giveaway day! 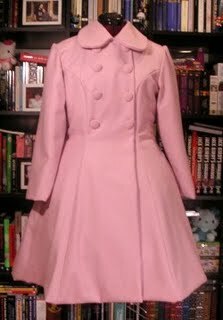 I'll be getting in touch soon to find out what size you'd like and to get your address :) I hope you'll show us if you do make yourself a coat. Thank you so much to everyone who entered! Sorry there could only be one winner this time. Also a few people asked about buying patterns - I'm working on this - hopefully I might have something sorted out after Christmas. I'd like to finally open my Etsy shop but I need a little time to draft some different sizes first.